mommy's reviews: Enhance Your Personal Security With Black Out! Ever since I have been married I get LOADS of junk mail. It took awhile for companies to figure out that my name had changed but once they did...boy oh boy-I got more and more mail. In fact, 95% of my mail is junk mail. I wish there was a way to get the idea across to people that I love to get mail...just not THEIR mail. :) One thing that I have always had to do is shred my junk mail. You know, so crooks don't get their hands on it and steal my identity. That has never happened to me (to my knowledge) and I hope it never will! If you, like me, are concerned about keeping your identity secure than you have to check out Black Out. This product is an "As Seen On TV" product that helps to prevent fraudulent use of your accounts, addresses and personal information. Black Out is a neat set of "tools" that you and I can use on our papers to hide our information. 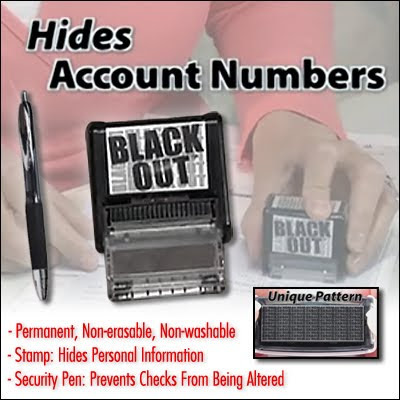 Each Black Out kit comes with a self-inking security stamp and a security pen. The Black Out Stamp is a jumbled stamp pattern that "stamps out" important data. You can use this on bills, social security numbers and junk mail. The Black Out Security Pen can be used when writing checks or signing important legal documents. The ink is permanent, waterproof and cannot be erased or changed. For this review I was sent a Black Out kit to try out and to be honest, I don't think the stamp works very well. I had to stamp my information twice to really cover it and if I held it up to the light I could still see what was under the stamp. It was not difficult at all to read it actually. So, I don't think that the stamp worked very well. The pen writes beautifully and looks like a normal pen. To test it I wrote on some paper and then ran it under water. The ink ran a bit at first but still looked extremely clear. No matter how I rubbed it, the ink stayed put. The paper disintegrated, but the ink stayed the same...clear and readable. I don't see any problems with using this pen and it seems to do what it is supposed to do. This Black Out kit can be purchased online for $10.99. It is not available in all stores. So, in my opinion...Black Out is not a bad product. While I do not like the way the stamp works and doesn't hide my information...I can still use it for minor cover-ups. The pen is great! It stayed put when wet and really writes nicely. I do not really trust this kit to completely protect my identity but it definitely is a really neat idea! Disclaimer: I received no monetary compensation for this post. I did receive a Black Out Kit for review purposes. All quotes and stock photos are from the Black Out website and email. All thoughts and opinions are 100% mine. What a neat idea! I never thought about that before! Hmmm...I guess if you stamped the area you needed covered a few times (and then once on the back of the paper) that might work. I do like the idea of a pen that won't run though. Hmm. I don't quite get the purpose of the stamp? I just shred mail and numbers I wouldn't want people to see. Even if you don't have a shredder.. rip it up a bunch or cut it up. The pen.. I could see that being good for people signing payroll checks and maybe for who you are writing a check out to so someone can't change it. This seems like a neat idea but maybe needs to be perfected a little.